At their meeting on Wednesday, April 22, members of Alford & District Rotary Club were joined by a group from Westhill Rotary Club. They were in Alford to present Susie Jones with a cheque for £500, which will go to Alzheimer Research. Susie, who is the daughter of Alford & District Rotary Club’s founder president Richard Lattimer, has been raising funds for the charity as her mother suffers from the illness. 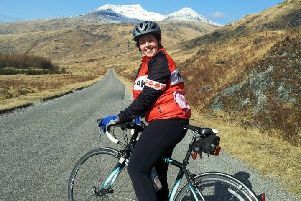 Since she started fundraising in 2009, Susie’s total has reached over £10,000. This year she will be taking part in the Baker Hughes 10k and running both the Race for Life in Aberdeen and the Great North Run Newcastle. Alzheimer Research’s work focuses on prevention, treatement and cure. To sponsor Susie visit http://ukvirginmoneygiving.com/letsdoit2015. Pictured: Susie with Westhill president John Fraser.